One of the silver screen's most cherished characters makes his triumphant return in Disney's spectacular all-new movie, Bambi II. The eagerly awaited next chapter of Bambi's unforgettable story continues for a whole new generation in a film that's sure to delight your entire family. Join Bambi as he reunites with his father, The Great Prince, who must now raise the young fawn and teach him the ways of the forest. But, in the adventure of a lifetime, the proud parent discovers that there is much that he can learn from his spirited young son. Thumper, Flower, Owl and your favorite characters return - and you'll meet some wonderful new friends - as Bambi's magnificent legacy continues. Illustrated in the breathtaking animation style of the original classic and bursting with enchanting new songs, Bambi II is truly a wonder to behold. When Disney concentrated their direct-to-video (DTV) efforts on sequels to modern flicks, fans weren’t enthusiastic, but they didn’t gripe horribly. 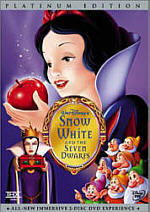 However, matters changed when Disney decided to create continuations of their older classics. I didn’t condemn these reflexively – indeed, I thought 101 Dalmatians II was moderately enjoyable - but I did think of them as questionable choices. Add a new iffy decision to the mix. 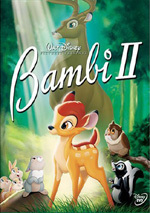 Technically, Bambi II offers a “mid-quel”, not a sequel. Like Beauty and the Beast: The Enchanted Christmas, this elaboration on the 1942 classic provides a story that takes place during the original story. Things pick up immediately after the death of Bambi’s mother. Despite some objections, his father (voiced by Patrick Stewart) takes in the youngster (Alexander Gould) to raise him. The movie follows their relationship as well as how Bambi interacts with animal pals like girlfriend Faline (Andrea Bowen) and bunny buddy Thumper (Brendon Baerg) and fends off various challenges. Of all the classics from Disney’s golden age, Bambi may be the toughest for which to create a sequel due to the original’s lack of story. Much of Bambi’s charm came from its inherent simplicity. We followed animals in a fairly natural habitat – or at least as natural as a Disney flick would allow. Some of that also appears during Bambi II, but not nearly as much and we get a much more modern emphasis on things. A tale about a father and son who slowly bond is fine, but it feels out of place here. If you want to make a sequel to Bambi, then create one that displays some connection to the original. This movie is much closer to the world of The Lion King than it is to Bambi. There’s only the most tenuous tether between the first flick and the sequel, and that causes serious problems. Bambi II totally abandons the feel of nature found in the original. Instead of realism and believability, it goes after goofiness and slapstick. The entertainment in Bambi stemmed from minor connections to real life, whereas the sequel prefers broad gags and silliness. Geez, we even get terrible lines like when the Great Prince states “A prince does not ‘woo-hoo’”. Not that I think Bambi II would be very interesting even with a different title and different characters. Utterly predictable and trite, it’s obvious from Minute One that the Prince will teach Bambi how to grow up while Bambi will show his pop how to have some fun. Haven’t we seen stories like this a million times in the past? It doesn’t help that we hear a song from a Celine Dion sound-alike within the flick’s first five minutes. Bambi II fails to connect with the original and it can’t stand on its own. This feels like a cheap way to capitalize on a classic. 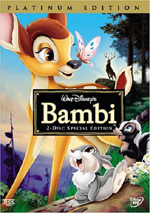 Bambi II appears in an aspect ratio of approximately 1.78:1 on this single-sided, double-layered DVD; the image has been enhanced for 16X9 televisions. While not one of Disney’s best transfers, this one looked good overall. My only minor complaints connected to sharpness. At times, wider shots appeared slightly soft. Nonetheless, the majority of the film was crisp and detailed. No issues with jagged edges or shimmering occurred, and I noticed no edge enhancement. Source flaws were also absent. As with the first film, the palette of Bambi II went for a light, pastel sense of nature. Greens and other woodland hues dominated and looked very good. They were subdued to match the tone of the story, but they seemed clear and concise. Blacks were deep and firm, while shadows appeared smooth and distinctive. This was a perfectly solid transfer most of the time. Bambi II included both Dolby Digital 5.1 and DTS 5.1. Any differences between them didn’t seem obvious to me. I thought the pair were identical. And that was fine with me, as both sounded quite good. The mixes offered broader soundfields than I expected. The sounds of nature spread nicely across the front and surrounds, and we got nice stereo separation for the music. The smattering of action sequences meshed together nicely as they utilized all five channels. In addition, the tracks presented a surprising amount of localized speech. Those elements popped up in the sides and surrounds with good definition, especially when Bambi thought he heard his mother’s voice. Across the board, the tracks offered solid quality. Speech was natural and distinctive, and I noticed no signs of problems connected to dialogue. Music was lively and dynamic, while effects seemed detailed and accurate. The mixes featured very good bass response as well. These were tracks that worked nicely for the movie. A few extras appear. Under “Games and Activities” we find Thumper’s Hurry & Scurry. This offers a “hide and seek” style contest in which you hunt and peck to find Thumper in the forest. I suppose it could be more tedious than it is, though I find that tough to imagine. Many Disney DVDs come with these lame guessing games, but this one’s more annoying than most. This area also includes Disney Sketch Pad. Here animator Andreas Deja teaches us how to draw Thumper in this three-minute and 43-second piece. We get a decent little tutorial in this simple short. “Backstage Disney” presents two components. The Legacy Continues offers an eight-minute and 16-second featurette. It features the usual mix of movie clips, behind the scenes bits, and comments. We hear from Deja, producer Jim Ballantine, director/writer Brian Pimental, art director Carol Kieffer Police, unit director Alexs Stadermann, unit producer Debbie Cramb, supervising animator Pieter Lommerse, and actors Patrick Stewart, Brendon Baerg, and Alexander Gould. The show looks at challenges involved with an update of a classic, animation research and other visual choices, and the voice acting. Should you expect any useful material here? Not really. We get lots of praise and attempts to convince us the sequel stands up to the original. Otherwise, there’s little to learn from this dull program. Anyway, the “Trivia Track” includes general notes about the movie such as connections to the original, animal facts, and artistic decisions. The text crops up pretty infrequently and doesn’t tell us a lot. It might be worth running while you watch the movie, as there’s not enough material to cause distractions, but don’t expect to learn much from it. The DVD also includes some Sneak Peeks. We get ads for Lady and the Tramp, The Wild, The Shaggy Dog, Brother Bear 2, Airbuddies, The Fox and the Hound 2, Pooh’s Grand Adventure, Leroy & Stitch, and JoJo’s Circus. The first four also appear at the start of the DVD. Some folks regard Disney’s direct to video sequels as an abomination, but I really try to go into them with an open mind, especially since some of them have been pretty entertaining. Unfortunately, Bambi II is nothing more than fodder for the DTV foes. Formulaic, predictable and trite, it never remotely lives up to the legacy of its predecessor. The DVD offers pretty solid picture and audio but it lacks substantial extras. Avoid this dull, spiritless clunker.